As part of a nationwide day of action against border surveillance, DRAD, along with Fight for the Future, Access Now, American-Arab Anti-Discrimination Committee, Demand Progress, and Free Press Action delivered thousands of petition signatures to Speaker Pelosi urging her to refuse to provide additional funding for a physical or technological border wall. 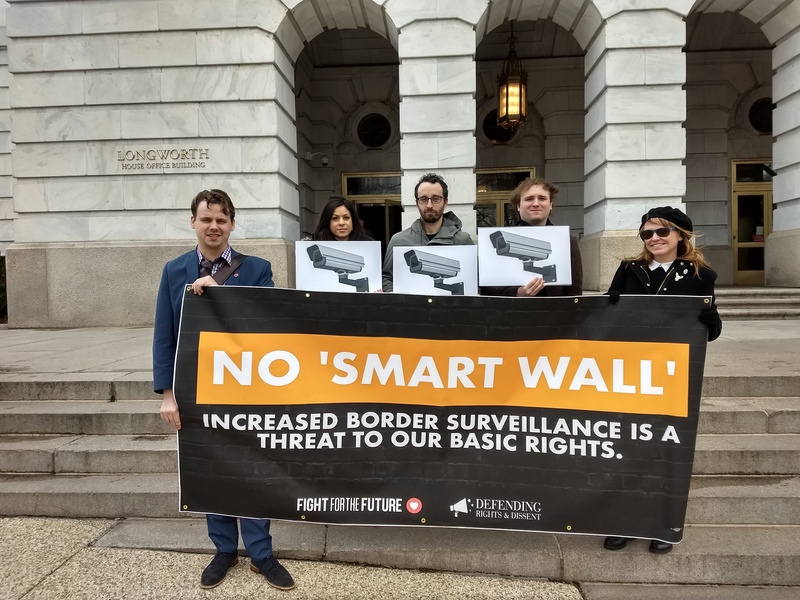 We also delivered an open letter to Congress signed by 28 human rights and civil liberties groups including DRAD, Fight for the Future, the ACLU, EFF, RAICES, Mijente, calling on Members of Congress not to fund surveillance technology at the border. Additionally, the Washington Post published an op-ed by Fight for the Future’s Evan Greer, More border surveillance tech could be worse for human rights than a wall. Video surveillance and drone spying: Drones enable the government to conduct constant, ubiquitous video and photographic surveillance of this area at an unprecedented scale. Drone footage of immigrants and US citizens alike can be stored indefinitely in massive databases, shared with hundreds of government agencies and local police, and used for a wide range of chilling purposes far beyond the originally intended scope. Targeting people with artificial intelligence: The Democrats’ original funding proposal calls for “an expansion of risk-based targeting,” which means increasing the use of artificial intelligence software to determine which travelers should be detained and subjected to invasive screening, interrogation, or incarceration. When a society decides to handover decision-making power to a computer it is a far reaching decision that deserves far more studied scrutiny than the typical government budget negotiations about border security funding on the number of detention beds or number of border patrol officers. Collection of sensitive biometric data: Democrats’ “opening offer” in the latest negotiations included $250 million for the Department of Homeland Security’s Office of Biometric Identity Management, which is tasked with conducting facial recognition and biometrics collection of travelers entering and exiting the US. Lacking meaningful oversight, there is essentially no limit to the ways an authoritarian government could abuse this kind of data, which includes personal details like family history and health information. We should be shutting down these surveillance programs, not expanding them. The border is often a testing ground for surveillance technology that is later deployed in American cities, almost always targeting low-income neighborhoods, immigrants, religious minorities, political dissidents, and people of color. Offering up expanded government spying as a bargaining chip in border negotiations could have far reaching effects on the most marginalized people in our country, fueling mass incarceration and automating racial profiling.